The time I knew I did things differently was when I created £33,225 net profit per quarter from one residential property. The property, In Earls Court, London, had 16 HMO’s, only 9 rooms in operation and a derelict ground and basement floor (which used to be a bridge club). When I started managing it, each room was making £350 per month so £3,150 gross. The expenses were £2,900 per month. £250 pcm profit wasn’t worth owning the property with all the maintenance this old mansion block needed within 5 years. My client was desperate for some income, but had no money left in the pot to put anything into it. …And I wasn’t about to give up on them. So, I asked them to give me 3 years and I would make it profitable. Month 1, I slashed expenditure by £500 a month, through capping the services to unused rooms, reducing the cleaning by 2 days a week and putting a timer on the heating to stop it being on 24/7. Next, I got a quote for gutting each room and turning it into hotel style studios, trimmed with an elfin kitchen, soft carpets, cosy double bed and a sofa… the cost £3,000 per room. With the savings I’d made my client could afford to do that in 6 months. I now had time to build my strategy. The new rooms had to start from the ground up, so that the tenants who were going to be paying the increase in rent for brand spanking new rooms didn’t see the old accommodation upstairs. I negotiated with the council to increase the HMO license to all 16 rooms. They agreed to this on a piecemeal basis, as the rooms were improved I’d be allowed an additional room on the HMO license. Then I negotiated with the current tenants to move them to an upstairs room where they could pay their current rent… and the upstairs rooms were bigger so it was an awesome deal. I closed off the lower floor rooms, switching the supplies over, so the expenditure stayed the same and we could still save that important £500 per month. Month 6, I project managed the first room renovation. By the end of the month I’d let it to a young professional for £950 pcm… a £600 per month increase. Month 9, there was enough money saved to do the next room. Again, let at £950 pcm. Month 11, the 3rdroom was refurbished. By month 12, we could afford to renovate one room per month. Then, to my surprise, the tenants who were paying £350pcm wanted the brand new rooms. My clients were excited by this and to reward their support, gave them discount rent to £775pcm. Of course, along the way a number of tenants decided not to renew their leases as they were moving out of the area and that was OK too. At year 2, 15 out of the 16 rooms had been renovated (we had a protected tenant who fought hard to not have his room upgraded, even though the rent would have stayed the same). Expenses had increased to £5,500 as there were more people in the building. And cleaning was back up to 5 days a week. It was time to something about the ground and basement floors. Over the following 6 months I obtained planning (with the help of a great architect) to convert the ground and basement floors into 3 self-contained flats. Once I’d got planning, development started. The process cost circa £100,000 for the planning plus development, but we were using the £8,225 monthly profit. The flats were beautiful, again inspired by hotel design. At year 3, all were fully let. The 2 bed flats for £2,450pcm each and the 1 bed for £1,950 pcm. 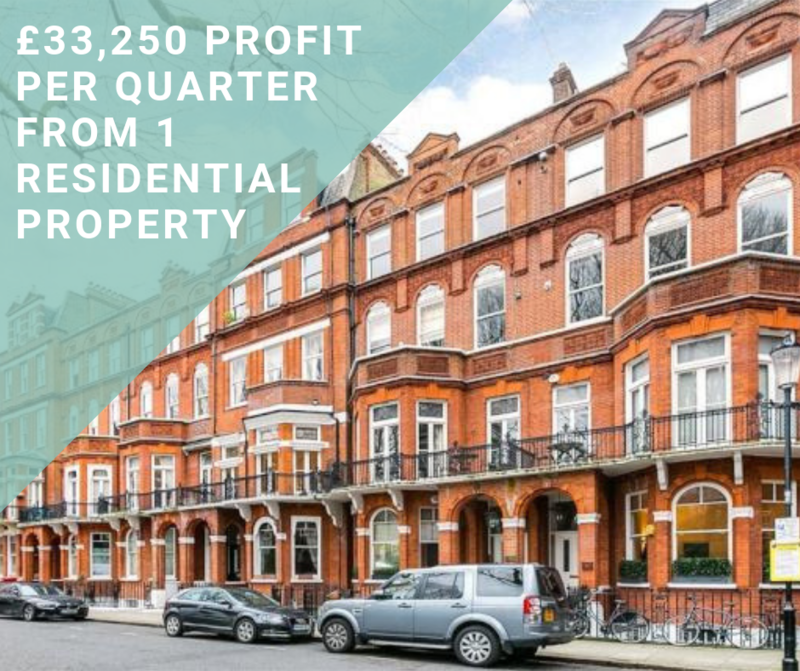 Total rental income was £20,575pcm for the building. = £11,075 pcm profit OR £33,225 per quarter income. Patience and a great strategy paid off. If you made it this far, congratulations you too have the patience it takes to build this kind of strategy and play the long game. Want to build a similar strategy for yourself? Good news the Members Club is now open, so we can build you a strategy that’s right for you. So you too can get this kinda success! What are you waiting for, the doors are only open for a limited time… click this Link to come on in.